The other night I did my nightly routine of letting my kitten out of the bedroom, because she was trying to bite my toes, and then listening to her scratch my door. I let her in, she bit my toes. I let her out, she scratched my door. Again and again. I thought: she will probably haunt me when she dies. She will never let me sleep ever again. Cats are persistent, agile, and mysterious. Sometimes you cannot tell whether they are looking at you lovingly or plotting your murder. In folklore, myth, and legend, cats have been revered and feared (just like real life, right?). Cats have been portrayed as murderers, portents of death, and dance partners of the devil. People have shared stories of cats returning as ghosts, continuing to bite toes and scratch doors. Irish and British folklore recommend removing cats (and dogs) from a house immediately after a death has occurred. A cat jumping over a dead body can compromise the spirit’s welfare (The Great Cat). In more mythical proportions, Scottish folklore warns of a fairy named the “Cat Sith.” This fairy is a giant black cat, with a small white spot on his chest and the ability to steal a dead person’s soul. Fearful of this fairy, the tradition of “Late Wake” began, which required guarding the body before burial. In an effort to keep the Cat Sith away, people would jump around a lot or lure away the fairy with catnip (mental_floss). When not stealing souls, cats forecast the death of a human. In British folklore, cats refuse to enter a home of someone about to die. Some say, a cat can also predict whether a dead person is going to heaven or hell. If the house cat ascends up a tree after someone’s passing, the deceased person is going to heaven. If the cat descends, they are going to hell (The Great Cat). The “Demon Cat” of modern American folklore is a ghost cat that haunts the governmental buildings of Washington, DC. Back in the day, cats were used in the basement tunnels to rid of rats and one never left. The cat appears before elections and tragedies. Notable appearances were before the assassinations of Abraham Lincoln and JFK. The cat (black, of course) appears as an average-sized cat (some sources say a kitten), but will swell in size when startled. By swell, I mean 10 x 10 feet. The phantom cat will explode or try to catch the witness, vanishing before touching his victim. Interestingly enough, this story may have started after a drunk, horizontal security guard confused a cat’s licks for a fierce attack by a giant cat (Wikipedia). During the middle ages, cats were associated with the Devil. Around 1348 CE, cats “were all but exterminated” during the Black Death, since they were supposedly linked to evil. Though, this worsened the problem; rats spread disease and cats are skilled rodent-catchers (mental_floss). Cats have historically had a close connection to death and the afterlife. This belief continues in the ghost stories we hear of cats returning to say good-bye to owners or simply hanging around the house. Cats, too, are highly perceptive when it comes to a ghost’s presence. 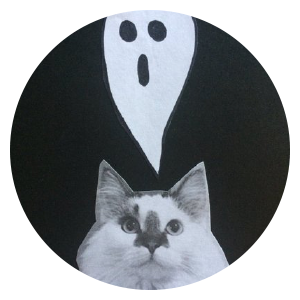 Today, I leave you with a story of a highly perceptive cat and a ghost named Charlotte. When I was 8, my family moved into an old Colonial that was built in 1810. My father still lives there. Until I was 17, every before I feel asleep, I would feel pressure next to me as if someone sat down on the bed next to me. This would always be accompanied with a feeling of increased pressure in the air. Although I knew this probably didn’t happen to everyone, I didn’t think about it much. Again, while this was a weird thing to happen, I didn’t really question it. Maybe the cat was just neurotic. I didn’t talk about this nightly occurrence to anyone. However, I did refer this feeling/presence/what have you as “Charlotte.” I don’t know why. So one day in the summer when I was thirteen, an elderly man and his middle-aged daughter pull up to our house and explain that the father lived in the house with his aunt while he was a boy and that he raised his family there for a few years. They had been visiting family in the neighborhood, and they wondered if they could take a tour for old times’ sake. My mom said sure. She, my sister and I led them around the house, and they recalled different memories. Afterward, my mom asked them if they remembered strange occurrences or stories about the house. “Like ghosts?” the old man asked and chuckled. His daughter became very quiet and said firmly, “It’s not funny, Dad.” The man explained that everyone who slept in one bedroom felt a little unsettled, and his daughter interrupted to say that she always felt as if someone sat on the edge of the bed and she tried to go to sleep. Her father said they used to joke that it was just his aunt looking out for them—his Aunt Charlotte. I spent a week sleeping in the guest room. When I got the nerve to go back to my room, I was nearly asleep when I realized I didn’t feel the pressure next to me. I did feel pressure in the air. I rolled on my back and saw the figure of a woman in her 60s, wearing a housedress, her hair pulled back in a bun, with her arms folded. She was looking right at me, very concerned. When I found my voice, she disappeared. I said out loud, “I don’t care if you stay, but I can NEVER, EVER, EVER see you again.” I never did. However a few years later, after my parents divorced and my dad moved in his girlfriend and her 4 year old son, I wasn’t really surprised when she told me her little boy said a lady named Charlotte told him stories at night. I liked your ghost story. I do believe that cats can see ghosts. I also enjoyed how you went through the different cultures and their beliefs on cats. I will need to dance around and spread catnip everywhere!